A universe of organisms living inside you may affect every part of your body, from your brain to your bones, and even your thoughts, feelings and your attempts to lose weight. This is a universe of trillions of microorganisms – or what we biologists call microbiota – that live in your gut, the part of your body responsible for digestion of the food you eat and the liquids you drink. As researchers, we have been looking increasingly into the effect these bacteria have on their host’s body, from obesity to mental illness and heart disease. With obesity, for example, these tiny organisms may play a big role by influencing what foods we crave and how our bodies hold onto fat. Chapter Download: The Hypothalamic-Pituitary-Adrenal Axis and Gut Microbiota: A Target for Dietary Intervention? 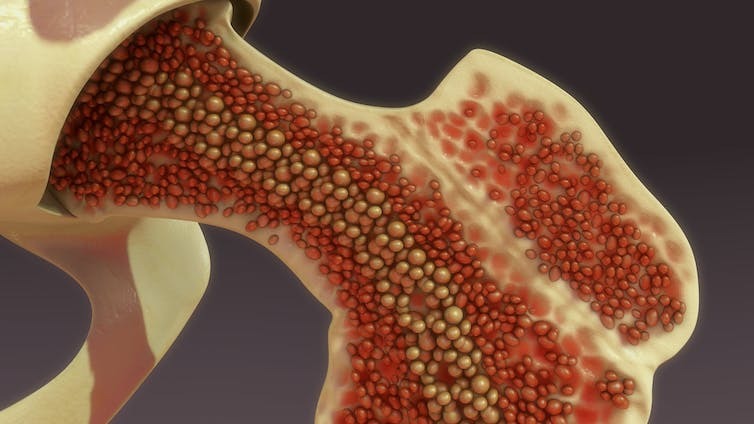 In a recent study of the gut microbiome, we set out to determine whether the microbiota in the gut can be affected not only by our nervous system but also by an unsuspected source – our bone marrow. Our hope is that, by understanding the interactions of the microbiome with other parts of the body, one day treatments could be developed for a range of illnesses. The gut, which includes your esophagus, stomach, small and large intestines, colon and other parts of your digestive system, is the first line of defense and the largest interface between the host – in this case, a person – and the outside world. After birth, the gut is the first point of entry for environmental and dietary influences on human life. Thus, the microbiota in the gut play a crucial role during human growth, as they contribute to development and maintenance of our immune system throughout our lifetime. While we initially thought of the microbiota as relatively simple organisms, the fact is that they may not be so simple after all. Gut microbiota can be as personal and complex as a fingerprint. There are more bacteria in your gut alone than cells in your entire body. This vast bacterial universe contains species that combined can have up to 150 times more genes than exist in humans. Research suggests that the bacteria in our gut predates the appearance of humans and that they may have played an important role in evolutionary separation between our ape ancestors and us. Healthy bacteria actively interact with the host immune system in the gut. They contribute to the barrier between disease-causing microorganisms or infections introduced via ingestion. They also help prepare the host immune system to defend the body. The wrong mix of microbes, on the other hand, can contribute to many digestive, immune and mental health disorders and even obesity. These tiny organisms work very hard in digestion. They help digest our food and can release nutrients and vitamins essential for our well being, all in exchange for the privilege of existing in a nutritious environment. Researchers are actively exploring the many facets of this symbiotic relationship. Recent data show a link between gut microbiota diversity and richness and the way we store fat, how we regulate digestion hormones and blood glucose levels, and even what types of food we prefer. This may also be a reason our eating habits are so difficult to change. 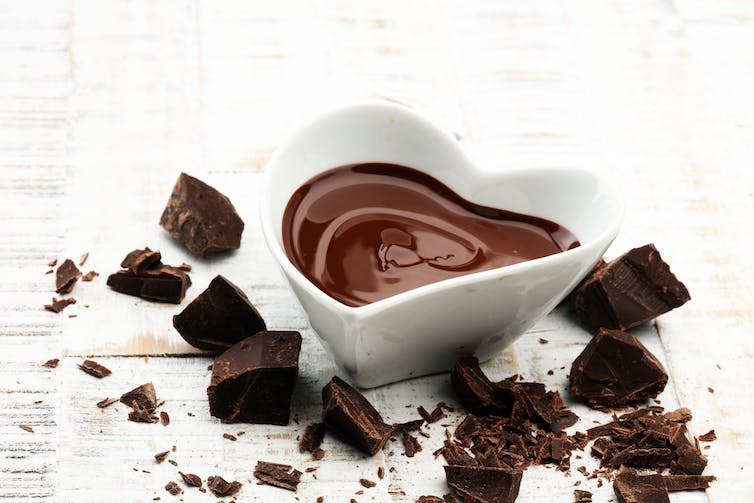 Some researchsuggests that microbiota may generate cravings for foods they specialize in – even chocolate– or those that will allow them to better compete for resources against other bacteria. There’s growing evidence of a link between the brain and our microbiota as well. The brain is the equivalent of a computer’s main processor, regulating all physiological variables, including the immune system, the body’s defense against infection and illness. All immune cells are “born” in the bone marrow. From our previous research, we knew that increased bone marrow inflammation, one of many consequences of high blood pressure, was driven by a direct message from the brain. The gut, too, plays an important role in preparing the immune system for battle. So we wondered: Could the bone marrow immune cells be playing a role in signaling between the brain and the gut? We wanted to find out. Using a novel experimental mouse model, we replaced the bone marrow that occurs naturally within a mouse with bone marrow cells from a different, genetically modified mouse. This replacement marrow was deficient in a specific molecule called adrenergic receptor beta, which made the bone marrow less responsive to the neural messages from the brain. In this way we could investigate how the host brain-immune communication will modify gut microbiota. Indeed, by studying this new mouse model, we determined that our nervous system – directed by our brain – can modify the composition of gut microbiota by communicating directly with the bone marrow immune cells. The brain, therefore, can change our gut microbiota indirectly by talking to the bone. Based on our experiments, we observed that fewer inflammatory cells were present in the circulation of mice that received the special bone marrow replacement than in those that didn’t. This means there are fewer immune cells able to infiltrate the gut and influence the bacterial environment. Thus, by suppressing the communication between the brain and the bone marrow, we observed a muted inflammatory response in the gut and a consequent shift toward a “healthier,” more diverse microbiome. This appears to be mediated via specific changes in inflammatory genes in the gut. However, this interaction between the host and the gut microbiota is very complex, and much more research is needed to pinpoint the exact mechanisms of their close communication. This may also be protective against weight gain, due to the very important role that both microbiota and the immune system play in obesity. A key to heart health, mental health and weight loss? This finding may also have implications in immune diseases as well as treatments either resulting in or employing immunosuppression. The latter may affect the gut microbiota, which in turn may cause unwanted effects in the body, including those associated with digestive and mental health conditions. In the context of cardiovascular disease, this muted inflammatory response appears to be beneficial, as it leads to beneficial lowering of blood pressure in our experimental mice. This could soon lead to a new class of drugs, called psychobiotics. Much like the “chicken and the egg” scenario, however, this complex interplay warrants further investigation to fully understand the consequences (or benefits) of perturbing one single component of the gut microbiota. This understanding is essential if we are to fully harness the power of manipulation of gut microbiota in health and disease, without negative side effects. The Hypothalamic-Pituitary-Adrenal Axis and Gut Microbiota: A Target for Dietary Intervention? Visit elsevier.com to access content on nutrition and more! Use discount code STC317 at checkout and save up to 30% on your very own copy!